SO you may ask, who goes to Beijing to eat a burger? But this was no ordinary burger. 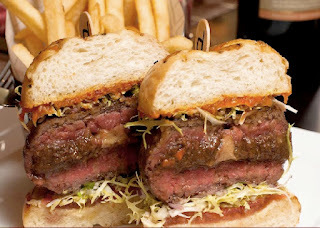 It was the world-famous DB Burger created by culinary impresario and Michelin-starred Chef Daniel Boulud. Usually available in New York, the decadent DB Burger is now available in Asia through Boulud’s Asian restaurant outlets in Singapore and China. 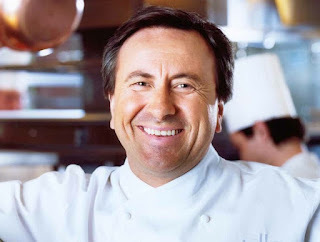 I was pretty curious about it since Boulud, of course, is French. So what was he doing messing around with something as American and mass-produced as the hamburger? Anyway, I finally got the answer after ordering the burger at Maison Boulud à Pékin on a recent trip to Beijing. The restaurant is in the stately gray old US Embassy building at the Chi’enmen 23 compound, just a skip away from the Forbidden City. The kitchen is ably overseen by Chef Brian Reimer, who, according to Maison Boulud’s web site, was formally trained at the Napa Valley Cooking School in St. Helena, California, and from there worked in the kitchens of various well-known chefs in the US and Europe (Thomas Keller, Michel Rostang, Jean Paul Lacombe, Jean Pierre Vigato, Michael Slow). He eventually became the executive sous chef at Boulud’s restaurant Daniel in New York; then in 2009, he was assigned to head the culinary team at Maison Boulud. Back to the burger. I was hardly prepared for this dish, despite seeing lots of photos of it. I was quite awed by the hugeness of it all. The sirloin beef patty itself was thick—almost 2 inches in height, and about 2.5 inches across in diameter. TThe original decadent DB Burger is a sirloin patty stuffed with foie gras and braised short ribs, served in a parmesan bun. How to eat it? Very carefully. I could taste the velvety goodness of the foie gras despite all that beef, unlike other burgers that claim to have the fatty duck livers in them. I don’t exactly know what the braised ribs were there for, perhaps just for extra heft, because it was somewhat difficult to make out its taste amid the beef and the foie gras. Unlike the New York version, this burger didn’t seem to have black truffles in them. (I went back to check the menu and, yes, it definitely didn’t mention the black truffles.) Perhaps these were not in season then or deliberately eliminated from the ingredients to keep down the cost of the burger. This was Beijing, after all. The patty was served in a soft Parmesan bun, with a humongous serving of pommes frites on the side. Any man would have no trouble putting away the entire thing; I, on the other hand, only finished half of the sandwich and probably a third of the fries—it was just too heavy. I felt all the meat and potatoes just kind of sitting there right in the middle of my belly. That is not to say I didn’t enjoy it. It was just a bit overwhelming. The DB Burger costs RMB168 a la carte. But if you order it as a main course in the prix fixe lunch (RMB 188), there is a RMB 50 supplement. At Maison Boulud, the hamburger is definitely given the decadent French royal treatment. • Maison Boulud is at Ch’ienmen 23, Qian Men Dong da Jie, Beijing. For inquiries and reservations: +(8610) 6559-9200.